• Connection to the Internet, such as WIFI or cell data plan from Verizon, AT&T, etc. 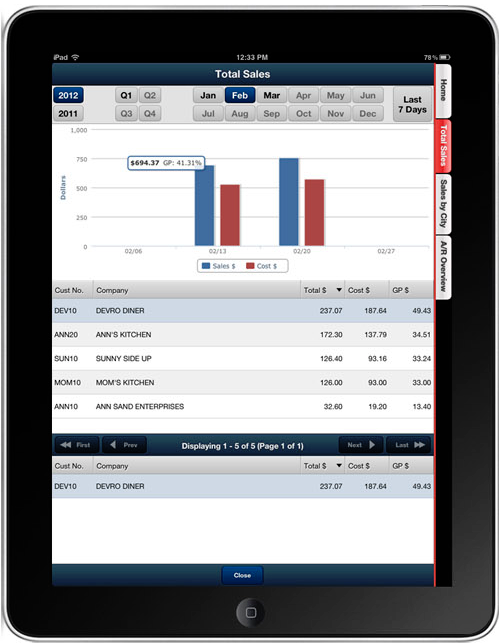 "The ELECTRONIC ORDER PAD has brought new excitement to my sales force. From its simplicity of use, to all its features, my company is sold on this technology for our future growth. I give the ELECTRONIC ORDER PAD my highest recommendation." - Justin Wilhoit, Atlantic Distributors, Inc.
"The ELECTRONIC ORDER PAD has helped our sales team be more efficient and productive. 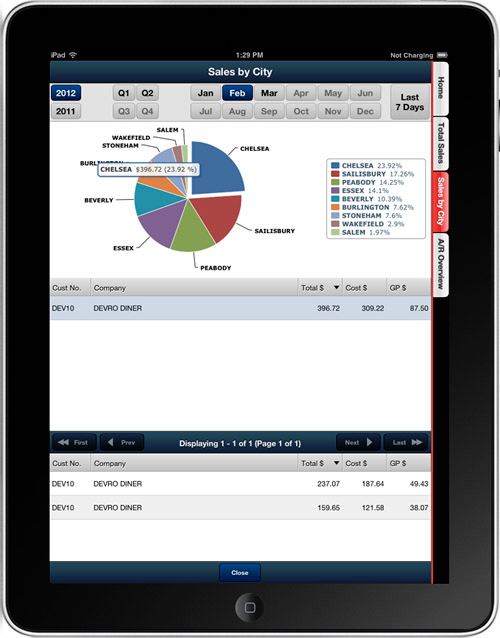 With their iPad, the DSR can literally bring every product description with them on sales calls, have access to current inventory levels, and streamlines the ordering process. It has moved our business years ahead of where we were before, and we highly recommend it to other NECS customers!" Download the White Paper – 7 DSR Solutions to Common Customer Service Problems. Your DSRs can easily track their progress toward sales and gross profit goals and target customers where more attention is required by using the Total Sales dashboard. They can select a time period and view detailed sales, cost and gross profit amounts for each of their assigned customers. When touching a specific customer, a drilldown section will show them the specific invoice detail information for that customer. The ability to focus on geographic areas by city for a selected time period allows you DSRs to manage their territory more effectively. The Sales by City dashboard allows them to view their total customer sales, cost and gross profit amounts by city in the pie chart. This dashboard is automatically generated and grouped by their assigned customers from the city location assigned to each of them. When touching a specific customer, a drilldown section will show them the specific invoice detail information for that customer. Especially in today's economic climate, your DSRs need to keep on top of their accounts receivable. 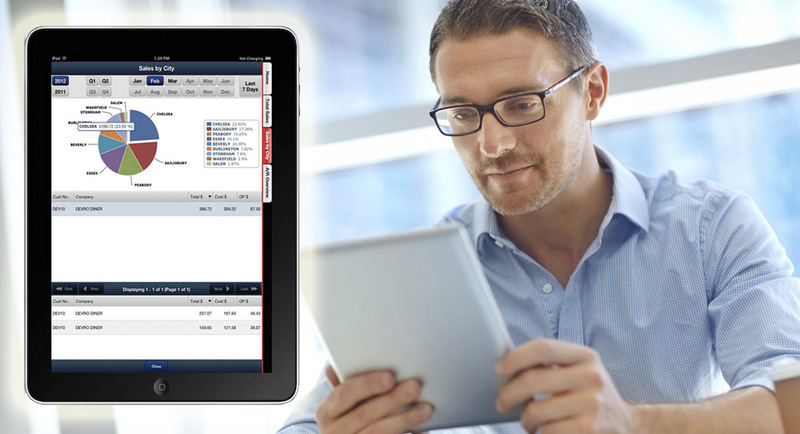 The A/R Overview tab allows your DSRs to see an overview of all their customers accounts receivable status for periods from zero to sixty days. They can quickly determine if a customer owes on previous invoices and how many days past due the customer payment is. 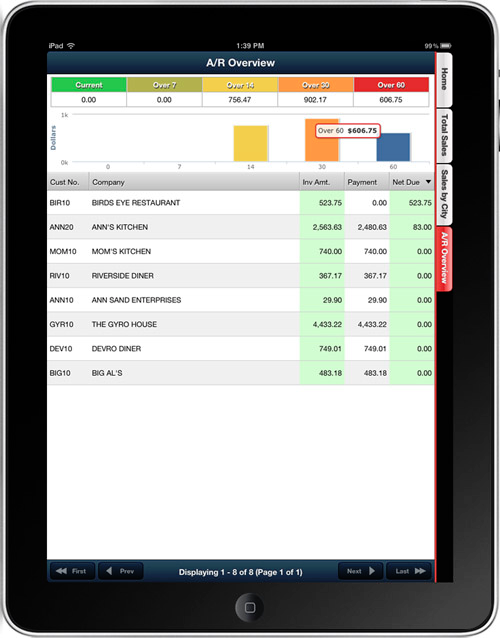 When touching a specific customer, a drilldown section will show them the specific past due invoice detail information for that customer.